Super Red Riding Hood by Claudia Davila (Author, Illustrator) was released earlier this month. Yes, that's LRRH as a superhero. Which really, when you think about it, is a natural with that red cape of hers. Rather surprised this hasn't been done a few times before in picture books but I can't think of any other examples in books. I have not read the book--only previewed through the Look Inside feature on Amazon--where these images came from--so I'm not sure how the wolf and other elements play out. But I am curious. I would have adored this as a kid and probably would have had a bigger kid-crush on LRRH, too. I wanted to be Wonder Woman and Batman at that age so I can imagine the glee this book would have inspired in me. Here's a picture book with a humorous new twist on what happens when red riding hood meets the hungry wolf in the woods. In this telling, our heroine Ruby loves red berries, her red boots and especially the red cloak her grandma made for her. "When Ruby puts on her red cloak, she becomes ? SUPER RED RIDING HOOD!" Sent by her mother to collect some raspberries from the clearing in the woods, Ruby reminds herself that she isn't frightened by the chill from the darkness, the loud tapping of the woodpecker or the snapping of a twig underfoot, because "SUPER RED RIDING HOOD is never scared!" But the final test comes when she encounters a towering wolf with a growling tummy. It will take all of Ruby's superhero skills to get him to leave her alone! Author-illustrator Claudia Davila has crafted an upbeat, modern-day fairy tale sure to delight the pre-reader set. The emotions of the little girl in the red cloak and red boots are the centerpiece of every colorful drawing, and some pages feature more than one scene to speed up the visual action. This is a great read-aloud story full of drama, with a positive message about not judging others too quickly, as well as character education lessons on being generous, brave, compassionate and respectful. It also offers an empowering example to both girls and boys of a strong character standing up for herself against a bully. 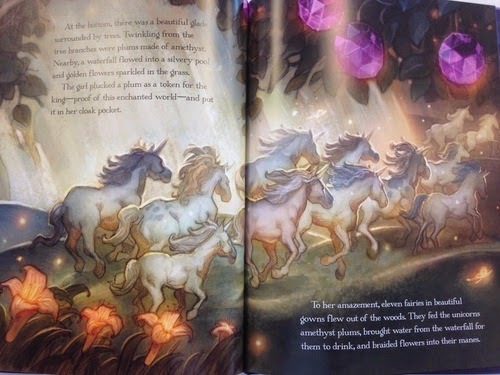 Twelve Dancing Unicorns by Alissa Heyman (Author), Justin Gerard (Illustrator) is officially released next week but is already shipping. The illustrations--what few I could find--the two here are from NPR's Tumblr account--are very lush. There is no text, so I can't comment on that. I haven't seen the book in person. But I love the illustrations and am tempted because the book is significantly discounted right now--almost bargain priced for a hardcover picture book. But I have to rely on review copies when publishers think of me. The SurLaLune budget has to be maintained to keep us all happy around here. 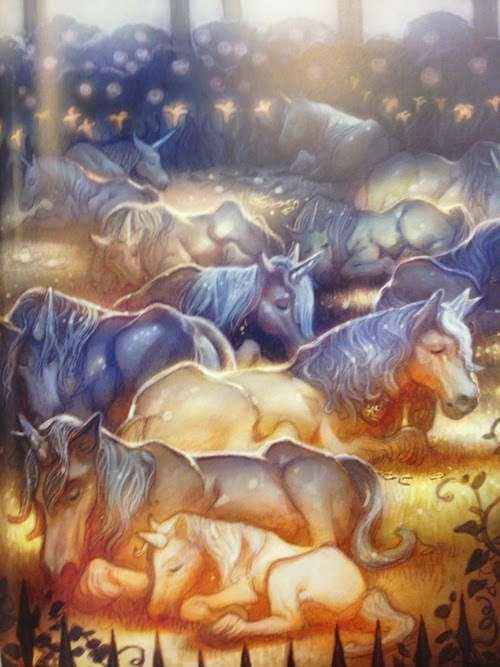 Once upon a time, a king owned twelve enchanting unicorns that he locked up with golden chains. But every morning, he'd find the beautiful creatures peacefully asleep in their corral—with their chains shattered. Puzzled, he promised a reward to anyone who could reveal the unicorns' secret. With the help of a magic cloak, a little girl sets out to discover the truth . . . and help the special unicorn that she loves the most. This charming variation on “The Twelve Dancing Princesses,” stars a delightfully spirited heroine and twelve magical unicorns. Alissa Heyman is a freelance writer who edited The Best Poems of the English Language (Mud Puddle Books). Her poems have appeared in the St. Petersburg Review, Lyric, and Quarto, and she has adapted The Big Book of… series for Sterling Publishing, which includes The Big Book of Horror, The Big Book of Fairies, and The Big Book of Pirates. Alissa lives in New York City where she also curates the Perfect Sense poetry reading series at the Cornelia Street Café. Justin Gerard has done illustration for DreamWorks, Warner Brothers, Disney, HarperCollins, Penguin, Little, Brown, and others. The Society of Illustrators featured his illustration “Beowulf and Grendel” in the 50th Annual of American Illustration, from his IPPY Award-winning book, Beowulf, Book I: Grendel the Ghastly. Justin lives in Greenville, SC. You probably can't fully appreciate this post without reading yesterday's Fairy Tales and Breyer Horses: Part 1. 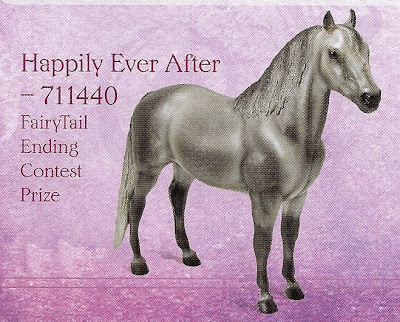 I want to thank Christine Ethier for sharing her images and knowledge and sending me to other resources for much of today's post about the BreyerFest 2011 Fairy Tail event. Every year, Breyer has a celebration called BreyerFest held at the Kentucky Horse Park. The celebration includes a vast amount of Special Run models. These include the Celebration Model (you buy a ticket to go, you get this model), Tent Specials, Raffle Models, and so on. Breyer’s most obvious connection to fairy tales occurred at the 2011 BreyerFest where the theme was fairy tales. Many models with fairy tale names were produced, including four Stablemates named after the fairies from Disney’s Sleeping Beauty, a set called Hansel and Gretel (strangely a mare and foal), a series of horses based on Rumpelstiken, as well as a horse based on the “Little Mermaid”. For a complete look at all the horses produced for the Fairy Tale event, use this link to Identify Your Breyer: BreyerFest 2011. 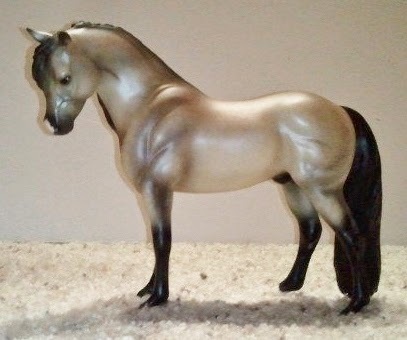 The website also includes a complete listing of all Breyer models. I found some other descriptions of some of the horses at BreyerHorseTalk.com with two posts--New BreyerFest 2011 Models Announced and More Breyerfest 2011 Models--by Erika which I will share here with some of the official Breyer images of the horses. If I couldn't find descriptions, I didn't offer them. I don't assume to know anything about identifying horses! The aforementioned unicorn, Aurora is decorated with flowers around the base of her horn, around her neck, and on her tail. She has dappling and gray points, and appears to have some kind of multicolored pink-and-teal pearlescent thing going on. Aurora will be a porcelain model. These four Stablemates molds in vivid Decorator colors will only be available as the Single Day Ticket Gambler's Choice Model. Flora is a pink Endurance, Fauna is a teal Driving, Maleficent is a peacock blue Rearing Andalusian, and Merryweather is a sky blue Friesian. I don't know what to call the lighter spots. I went a'Googling for goat coat colors, and the variety is amazing. But I couldn't find a name for the big spots. I shall call them Mega-Dapples. I'm glad to see more non-horse models getting some spotlight time. I never got around to writing about this year's benefit model, which benefits the SPCA. It's an adorable set with a horse, a dog, and a cat. Love it! It seems like the non-horse models get short shrift - which makes sense, really - but I love seeing them get their proper due. These are both Classic scale models, a size which seems to be largely overlooked by collectors, but still popular with hobbyists. These are both NEW models for 2011, sculpted by Brigitte Eberl. I can't find any more information on these models online. Judging from their proportions, they may be ponies? At any rate, it's a lovely paint job on both mama and foal, with a chocolate brown body and white mane and tail. A beautiful dark red bay with an appaloosa blanket, using the Show Jumping Warmblood mold. This is a handsome model, but I don't really get the Fairy Tales tie-in with this one, aside from the name. Is there a pun here I'm missing? Like how Wish on a Star has a star-shaped marking? Only three Perrault molds will be available! They are the Early Bird Raffle Prize, so you'd better get your tickets ready! Perrault is a leopard palomino appaloosa on the El Pastor mold. This is a swirly blue Decorator version of the Bluegrass Bandit, designed by Kathleen Moody and Summer Prosser in 2008. Is the model made of translucent plastic, or is that just how it looks in the pictures that have been released? I guess we'll have to wait to find out! From Heidi: If you do an image search for Under the Sea online, you will see that it is translucent and quite pretty! This is a really outstanding tobiano pinto paint job on the ever-popular Big Ben mold. He appears to be a dappled gray, or possibly a blue roan base color with dark points, a bicolored tail, and a big splashy star-shaped marking on his shoulder. This is a dappled gray Justin Morgan. Only one will be made, as the prize for the Fairytale Ending contest. Okay, remember the Fairy Tale Blogger posts from a few months ago: You Know You're a Fairy Tale Blogger When....? A common theme was of the "too much to cover, not enough time" variety. Here is where I show my knickers and admit that the following post(s)--since part 2 will be tomorrow--have been sitting in my inbox mocking me for TWO years now. SurLaLune readers--as you know since you are here reading here--are a very generous bunch. One of the cream of the crop is Christine Ethier who shared a Fairy Tale Gifts post a few years ago in which she mentioned fairy tale themed Breyer Horses. I wanted to know more. She shared. I've let her work sit for years in my inbox. You'd think I was a traditional book publisher instead of a blogger with instantaneous publication abilities, wouldn't you? But in this case, better late than never. So today I will share part 1 in which Christine shares information about Breyer Horses in general and fairy tales specifically. Tomorrow I will share a bit more with images about the Breyerfest 2011 which had a fairy tale theme. Breyer Animal Creations was born in 1950. The first model produced was the Western Horse. The model appeared as part of a clock for Mastercrafter Clock Company. The model was then produced for Woolworth’s where it sold well. In 1984, the company was brought by Reeves International, Inc. Production and headquarters were moved to New Jersey, with some production being moved to China in 2001. Before the model is produced, an artist sculpts a clay statue. Then resin prototype models are produced, followed by metal molds. The model as sold in stories is made using ABS or Cellulose Acetate (a process that leaves some models with air holes). Most of the paint is airbrushed on, though depending on the type of model or horse produced, there may be hand painting done. Collectors of Breyer models use various terms. Two of the most important for this article are Mold and Model. The term mold refers to the style of a model, not the paint job, but how the horse stands. The mold number is usually the first horse done in that style. Model refers to actual number assigned to the piece by the company. Mold numbers are also used before the abbreviation SR, Special Run. Therefore, 496SR, means mold 496 in a Special Run, a model that was produced only for a certain time, event, or company. In 2004, Breyer released Romance (#1224). The model shows two scenes that seem to be inspired by “Cinderella”. Romance was produced on the Huckleberry Bey (a famous Arabian stallion) mold (#472) and was sculputed by Kathleen Moody. This was produced until 2006. In starting in 2003, Breyer released some Stablemate sets that have fairy tale themes. The first is Fantasy Breyer set. (Model #5911, produced only in 2003). The horse is the G2 Rearing Arabian by Kathleen Moody. The second is the Medieval Play Set, which was produced in 2003-2004 and numbered 5910. The horse is the G2 Clydesdale by Kathleen Moody. Note the knight is a woman. The third is #5989 Princess and Carriage Play set, which ran from 2004-2005. The adult horse is G2 Andalusian; the foal is G1 Thoroughbred Lying Foal sculpted by Maureen Love Calvert. A quick word about pricing. The price of a particular model is determined by a variety of factors. The most obvious is the condition of the model. A model that is extremely old is not going to fetch as much money if the condition is extremely bad. Collector’s usually grade models on a scale of 4 to 1, with 4 being near prefect. Additionally the term LSQ is used. LSQ stands for Live Show Quality, which means the model is relatively free of imperfections (a mistake in the paint job for example) and damage (which is anything from a rub or broken piece). Current production models tend to run anywhere from just over three dollars (for Stablemates) to over 100 dollars for Special Runs models sold though Breyer’s website. The average price for a traditional model is 25-35 dollars. In regards to retired (no-longer produced) models (which are most of the models in this overview), the cost will vary. Outside of condition, the mold, rarity, artist, and paint job affect the mold. Popular molds include Silver, Spirit, and the American Saddlebred Stallion. Models produced for sale at Breyerfest (the yearly convention) tend to be more expensive right after the event, and then level off in about a year. The most expensive models on the resale market tend to be either Raffle models (usually 25 or under of a model), Connoisseur Models , Presentation Models (older models on a wooden or plastic base) , or older decorator models (models with a gold or blue paint job). These models can run in the 100s of dollars. Always compare prices before buying. Breyer’s earliest forays into fairy tale horses, were simply fantasy horses. Over the years, Breyer has produced several unicorns and Pegasus models in various lines. In most cases, the unicorn or the Pegasus was made at of basic mold and then given a horn or wings. The only original sculpture was the Little Bit Unicorn 9020 (below). The mold made its debut in 1984. The sculpture is by Chris Hess. The mold has been used for seven models, including two special runs. All images in this post are courtesy of Christine Ethier. Puss & Boots by Ayano Imai was released in May of this year here in the states. This has become one of my favorite picture book versions of Puss in Boots--note it is Puss & Boots here, for this one's different. And also a little harder to find in a book search with the clever word play. Oh well. The story isn't quite the usual Puss in Boots but I like this version a lot. There's a shoemaker this time. And lots of boots of different sizes. And it is beautifully illustrated. A poor shoemaker must close his business as there is no work, but his cat is determined to save the shoemaker from his plight. Using a magnificent pair of boots and a sly plan, the trusty cat tempts a monster and tricks the beast into using his own vanity against himself. With the monster defeated, the shoemaker reopens his shop and can once again sell his beautiful shoes to the townspeople. A beautifully distinctive retelling of a classic tale, this children’s book features enchanting illustrations from acclaimed artist Ayano Imai. Pssst. You can click on the images to see them larger and read some of the text. The Fisherman and his Wife by Renate Raecke (Author), Jonas Lauströer (Author) was released last year in the UK but hasn't been released in the US. You can only purchase it through third party sellers stateside. Captivating story of an enchanted prince granting free wishes. Atmospheric illustrations by Jonas Lauströer. Handsome edition; an ideal gift book. The perennial Grimm fairy tale of a fisherman, his greedy wife and a magical flounder. With a striking contemporary twist and atmospheric illustrations, this is a story relevant for all ages. The interesting twist in the story--spoiler alert!--is that as the wife makes more grandiose requests, the world becomes more polluted. The book appears to be set in the past at first and then firmly establishes that we are in modern day. The wife eerily resembles Queen Elizabeth II. Not being political, I can't really comment on that, but the resemblance is unmistakable. The publisher, minedition, states that this is a bestseller in the UK, but it doesn't have any reviews on the Amazon UK site to see what some of the readers think of it. Overall, a fascinating take on a traditional tale.